Developer of “Cogs” steampunk game inspired by BG! Thanks, for the complement, Lazy 8! Looks like a cool game, and we’re definitely proud to be part of the inspiration for the design! Starting this May 1, brought to you by the premier steampunk websites, communities and publications, is the Great Steampunk Debate about the ideology of the movement. 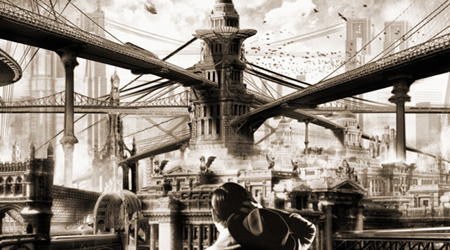 Since steampunk inspired a distinct subculture, divorced from its roots in speculative fiction, the question of its politics has emerged occasionally without being ever answered conclusively. Many have volunteered definitions and interpretations of “steampunk” but failed to satisfy the whole of the fandom. The Great Steampunk Debate offers a forum to steampunk enthusiasts of every kin and kind to debate, and hopefully decide, the matter, once and for all. The discussion will take place under four headers; the first being “Politics” to exchange ideas about both the internal politics of steampunk and its relationship with the wider world. Under “Steampunk and the 19th century,” we talk about how the reality of the Victorian era and our modern day world relate and collide. Issues as sexism, racism, class struggle, entrepreneurialism and etiquette can be brought up here. “Scene” is for discussion about the nature of steampunk as a social phenomena. Is it foremost a genre or a subculture? A hobby or a movement? Real world or virtual? Lastly, to talk about the relationship between steampunk and its roots in past literature, artefacts, architecture and culture there is the “Inspirations” section. Go to greatsteampunkdebate.com today and register! Good Day steampunks! It is time for another report from the “darker, dirtier side” of the alternate history genres we hold so dear. First things first: there is lots of snow out in these parts of the world and if, like your correspondent, you rather not venture outdoors, know that there is plenty to read online. Issue #10 of the Gatehouse Gazette and issue #5 of Exhibition Hall are both available for download now—entirely free of charge. Both online magazines feature excellent cover artwork this winter. For the aviation issue of the Gazette, Mr Myke Amend delivered an exciting painting while Molly Porkshanks Friedrich (also on flickr) did an outstanding job for the latest edition of Exhibition Hall. Be sure to check out all of their work—Amend and Friedrich are without a doubt among the finest of steampunk artists out there. Regular visitors of The Gatehouse might be familiar already with Sjón Refur’s Cinema is Cinema hosted blog. Those particularly interested in Golden Era motion picture will want to follow the companion edition to this fine feature also! Over at Wings of Steam, you can read Steampunk 2009 Year in Review, listing all the highlights of steampunk during the past year. “Early in the year there was discussion throughout the community over whether or not steampunk was dead,” notes the blog. Not only has that prediction been proven wrong; steampunk has entered the mainstream in fashion and decor and continues to attract interest. Dieselpunks is crashing into the New Year with a bang. 2010 has them taking a look back at the technology of yesterday and the engineering wonders of today. The future has given us the tools we need to communicate and the tools we need to build our dreams. “All we need is the spirit, and for that we look to the diesel era for the zeitgeist needed to use these tools properly,” according to Dieselpunks. Hello, Brass Goggler! It’s been a while, I’m afraid, but fear not, I’ll get you up to speed in no time. The newest steampunk fanzine Exhibition Hall released its fourth issue earlier this week. The publication continues to cover recent events, reviews, even a bit of fashion now, and original fiction. Both Dieselpunks and The Gatehouse have been focusing a lot on dieselpunk architecture lately. Click here for an overview of Tome’s “Art History” series at Dieselpunks and here for all posts about architecture at The Gatehouse. 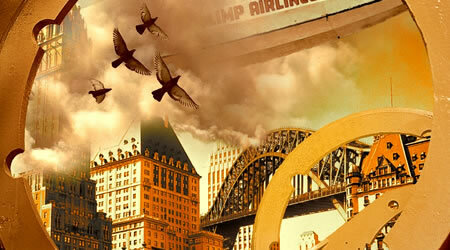 Speaking of Dieselpunks they recently launched an online gift store for steampunk and dieselpunk enthusiasts. Buy books, DVDs, games, music and jewelry at Amazon via the store to support one of the greatest dieselpunk communities online! Disney is currently working on something of a steampunk version of Mickey Mouse. According to The New York Times, “the introduction next year of a new video game, Epic Mickey,” will present the “formerly squeaky clean character” as “cantankerous and cunning, as well as heroic, as he traverses a forbidding wasteland.” For a taste of things to come have a dekko at those artworks that are allegedly concepts for the video game. Looks like good stuff, not? For a fine collection of vintage Bohn advertisements by Arthur Radebaugh, Lord K has an album full of it. For more of the man’s postings, also visit the Dieselpunk blog. More vintage is available on Dark Roasted Blend: enjoy their Fabulous Las Vegas page, full of photographs and advertisements from the earlier days of the town. Good day, visitor! We have an update again for you today on what has been going on in the darker, dirtier corner of our ‘punk genres. The November issue of the online magazine the Gatehouse Gazette has been released, devoted to “Beautiful Industry”. The Traveler’s Steampunk Blog writes: “Despite all the ills industrialisation caused and causes (workers’ exploitation, pollution, rampant urbanization, industrialised warfare) it also created the infrastucture, productivity and basis for advances in science and technology which today provide the highest standart of living the world has ever seen.” And that is exactly what the latest edition of the magazine celebrates. Also available for reading is the third issue of Steampunk tales with ten original short stories for just $1.99. And a third ezine, called The Condordium is currently in the making. Keep your eyes out for more there! The Edwardian Promenade is normally not the darkest place of weblogs, but for Halloween, they delivered a nifty post about Hallowe’en In the Gilded Age: a brief history of a holiday that should certainly be steampunk’ed more, we say! Lastly, for a fine collection of recent dieselpunk fashion styles, stop by at Gearing Up, regularly updated with glamorous photos from both the Golden Era and now. Worth a look, I’d say..
Good day, ladies and gentlemen! 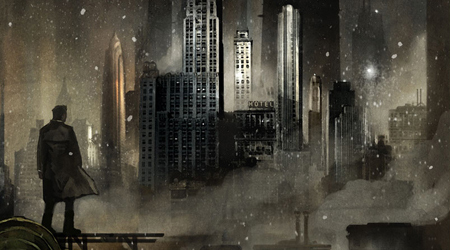 After our first report there is, of course, more than enough left to discover in the realm of dieselpunk so let me share another good bunch of links with you today. 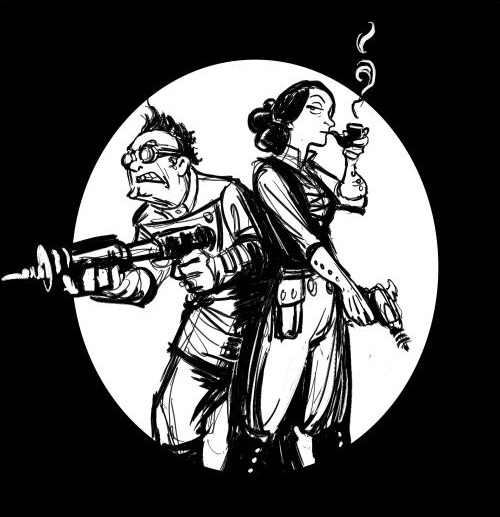 The website Dieselpunks has the pulp works of George Gross and the high flying adventures of Laurent Negroni and Elly Beinhorn on offer, all certainly worth checking out. New at The Gatehouse is the hosted blog Cinema is Cinema by Sjón Refur, discussing period film from an expert point-of-view. Dr Damon Molinarius, “steampunk, polymath, philosophe, chrononaut, explorer of the ideal,” posts at the blogs Strange Undisciplined Dreams of Great Things and posts steampunk art and fiction at Strange Dreams. Recent features of interest include steampunk short stories and The Imaginarium of Doctor Parnassus. The Flying Fortress had an interesting post some time ago about the Second Industrial Revolution: a significent event in the economic development of Germany, Japan and the United States for it forebode their predominance in early twentieth century technologies. The advent of electricity, mass-production and consumerism defined the Edwardian era as well as the Roaring Twenties and, as such, it is one of those things that makes dieselpunk definitely different from its big brother, steampunk. For a look into the future that never was, visit David Szondy’s Tales of Future Past: a bit old but still updated every now and then with wonderful stuff. Artwork by Stefan from Paris. Brass Goggles has always celebrated the lighter side of steampunk: the cheerful and bright aspects of the genre, the goggles and the zeppelins and the brass; the sort of steampunk that we can all blissfully enjoy in colorful reminiscence of times past. But there is more to the genre and to the movement than that. Indeed, from the very start, there were some rather dark and gloomy novels that anticipated the popularity of steampunk. Morlock Night (1979), The Steel Tsar (1981) and Homunculus (1986) aren’t exactly the sort of stuff one happily reads to the children. Even Alan Moore’s The League of Extraordinary Gentlemen is pretty dense. And these days of course, we have the film noir-ish back alleys, the petroleum and the pollution and Nazi experiments run amock of dieselpunk. It is from this “darker side” of things that I would like to bring you regular reports here at Brass Goggles for there is a lot going on that even the aficionado of the Neo-Victorian ought not to dismiss right away. First, since rather recently, there is Tome’s website and community Dieselpunks to persue. With interviews with steampunk and dieselpunk artists, authors and musicians as well as a blog and discussion forums, Dieselpunks offers plenty of good stuff. If you care to learn more about the fashion and lifestyle of dieselpunk, visit Gearing Up: a nifty blog updated every so many days with excellent pictures. To learn more about the history of the genre, read the Dieselpunk Chronology of Steampunkopedia. 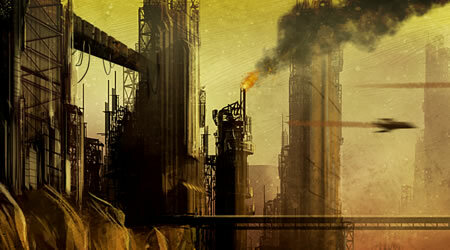 The website also has an extended Steampunk Chronology on offer and is updated regularly with the latest in both genres. Of course things aren’t always dark in dieselpunk (just think of Sky Captain and the World of Tomorrow) just as things aren’t always so bright in the realm of steampunk. 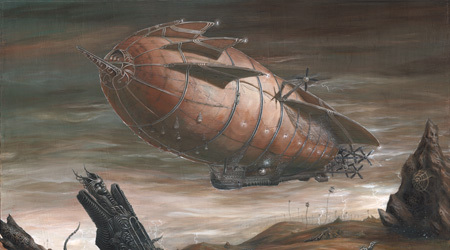 The French blog Steamblog does a great job at showing how steampunk can be gloomy at times while the project Monsters in the Sky is worth checking out if you don’t object to gargantuan ironclads steaming ahead among the clouds. That is all for this Report then. I shall be back with more news not too long from now. Stay tuned! Artwork by Sam Van Olffen.